Google announced that it will be adding a messaging app that will be compatible with Android and iOS devices. This was announced initially in May but may have been critical of Google for not meeting privacy concerns. Google stated that the responsibility of privacy is something they take most seriously and all chats shall be fully encrypted using the technologies that are standard for messaging apps. This includes end-to-end encryption and other features pertaining to expiration of messages and notifications that are discreet. Yet, the app will maintain all messages that are not incognito by default, which is a change in its position from statements made previously that it would store only those that are unable to be identified or are transient in nature. 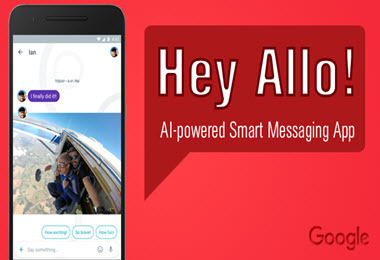 These changes have been made to increase the smart reply aspect of the app, am aspect of machine learning and allows more data to be accessed, however it will come with substantial consequences should paw enforcement agencies submit access to any messages sent using the google app. There are a number of features notable with the app. The first is the smart reply which will offer suggestions to questions that are common and this is designed to improve as the user accesses the app more often. Additionally, google offers an assistant that can join group chats to answer questions relation to meetings, weather and news etc. The assistant is an interesting feature as it will furthermore allow for the sharing of videos on Youtube as well as games without the need to exit the app itself. Currently, it is only offered in English but additional languages are being added in the coming months ahead. Allo also shall enable those using it to alter the emoji’s sizes, change text size and make notes on pictures prior to sending to other users. 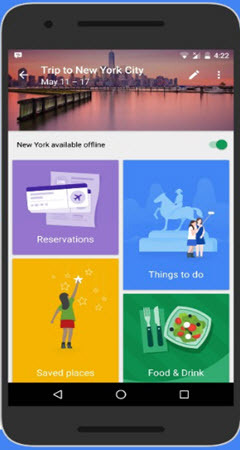 Google also announced that it has released another app for iOS and Android called Google Trips. It is designed to help in the reduction of stress when planning a trip or holiday. It includes the ability to locate popular locations in over 20 sites throughout the world and can be viewed online, or by downloading the app directly to smartphones or mobile devices. The point of the app is helping to allow users to get the most out of their vacation experiences as studies have shown that most people feel more could have been accomplished while travelling. It is meant to take the role of a personal assistant per say or a tour guide in your pocket when on holiday and wishing to learn to find interesting facts about locals you are visiting such as places to visit or go to when wanting to eat.